What were Western Australia’s reasons for not wanting to part of the new commonwealth? When did they join the rest of the colonies in deciding that they would be part of it? 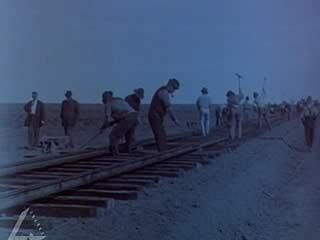 The main equipment available for building the railway was human muscle (3,500 men), 750 camels and horses, trains able to run on the completed parts of the tracks and very little mechanised earth-moving equipment. There were no roads, no permanent water supply and no local produce available. Today, Perth is still seen as one of the most isolated capital cities in the world. Do you think that the construction of the railway helped curb the feeling of isolation? What points do you think a Western Australian would put forward to argue otherwise? Navvy: a worker employed in making roads, railways etc.